The hoarding disorder can be brought on by a number of different situations, which can be brought on by an obsession, and in by a person's age. 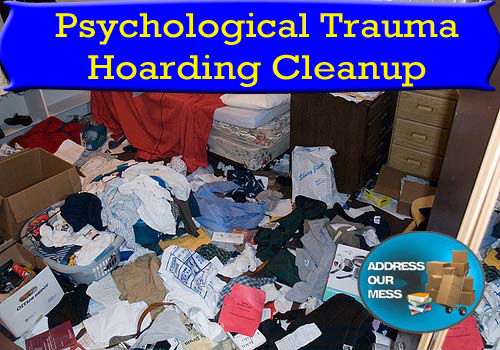 The most problematic cases of hoarding are caused by individuals who suffer from physical or psychological trauma, and Address Our Mess is here to help those individuals recover their lives. People who suffer from psychological or physical trauma can have far worse hoarding cases. Address Our Mess is starting to help individuals who are suffering from traumatic hoarding experiences in all of the states that it covers. The crews and case managers are willing take on this new challenge, because of their experience handling severe clutter and hoarding projects that are similar in nature to that of traumatic hoarding. There are techniques to help hoarders, however there are difference between different types of hoarding. What is trauma hoarding and how is it different than the normal hoarding disorder? Normal hoarding behavior is brought on by onset of a compulsive wanting of a particular item. These items can range from old electronics to items bought off the internet or television. These individuals have a compulsion that is brought on by an uncontrollable mental want or fixation on a particular item. The behaviors are not brought on by a depression complex or something that they are regretting that they are no longer able to perform the tasks. Also, normal hoarding disorder behavior can be resolved through the consultation of a psychologist to understand the true reasons why a person could be hoarding. Another factor is that the normal hoarding is brought on by age. Age and hoarding can in many circumstance can go hand in hand. The hoarding may have been the result of the elderly individual being able to maintain their property to the former cleanliness standard that they were accustomed too. Elder mental health can in some cases have to do with the creation of a hoarding disorder problem in their home, which can be brought on by the onset of Alzheimer’s or Dementia. This of no fault of the individual of hoarding, but that of genetic circumstances and the age of the individual. All of this can be resolved with the helped of loved ones who are willing supporting their elderly family members. However, trauma hoarding is significantly more problematic. People who suffer from the psychological trauma or physical trauma of loss can have far worse hoarding cases. These individuals have had an even in their life that has caused them to succumb to the hoarding disorder. This can be the loss of a loved one, and they are trying to keep all their possessions that remind them of this particular person in their home. Or they suffered a physical trauma that could have rendered them unable to continue doing a particular action that they enjoyed or did for a career. All this factors into a trauma hoarding scenario, and Address Our Mess can help handle these situations. Address Our Mess is willing and has the skilled staff to handle these trauma hoarding situations. These are difficult cases, but their case managers are able to help the hoarders decipher what is necessary and what is not. They show compassion to these people, because of their training in relating to these people and giving them the respect that they need in order to help them recover and return to a productive and safe life. Psychological Trauma Hoarding CleanupHoarding can be brought a person who had a great psychological trauma that occurred in their life. One of the services that are offered by Address Our Mess is specifically towards those individuals who suffer from trauma hoarding disorder.